This year’s recipient from White Plains High School is Durwin Daley, currently in the Healthcare Services Administration bachelor’s degree program. One of this year’s recipient is Betsy Roman Jaquez, currently in the Health Information Management associate degree program. Betsy says, "I am working hard towards getting my associate degree in Health Information Management. The past few terms have been challenging in many ways. This scholarship will benefit me and my educational goals by allowing me to finish school, which I did not think would be possible after my employer sold his business leaving me with no job, making it very difficult to pay for my education. Finishing school is extremely important to me and winning this scholarship has helped ensure I will accomplish my goal.."
The second recipient is Aneika Daniel, who is a 2019 BBA Graduate in Healthcare Services Administration. Aneika is also a member of Phi Theta Kappa Honor Society. This year’s recipient is Lauren DeAngelis, currently in the Medical Assistant Management associate degree program. Lauren says, "Being able to attend college is something that should not be taken for granted. Some people wish they could attend a school like this. It’s very important to always take every opportunity you receive during school and later on in work. This is one of those opportunities. There are many ways how this scholarship will benefit me and my career goals. I planned on being done with school by now and having a career. I started a school in September of 2017 and was supposed to be done the following year. However, in April of 2018, the school abruptly closed, leaving me and my classmates with no answers and not even a clue on what to do next. This year’s recipient is Samantha Granieri, currently in the Business Management/Marketing associate degree Online program. Samantha says, “As a full time working, single mother, attending school is very difficult. However, I have a 3.87 GPA and I am a member of Phi Theta Kappa. It has been a hard, but incredible journey. This year’s recipient is Ana Gomez, currently in the Healthcare Services Administration bachelor’s degree program. Ana is also a member of Phi Theta Kappa Honor Society. Ana says, “I am so grateful for this scholarship as it will really help me to pay for school and it will help me stay focused on graduating. I have worked really hard to come this far. It’s been really hard for me because of personal obstacles, but I always push myself to do my best in school and at work. I enjoy going to The College of Westchester and they have helped me so much; they truly treat me like family, and I appreciate everything they have done to help me achieve everything I have accomplished so far. This year’s recipient is Nicole Kotash, currently in the Accounting bachelor’s degree program. Nicole is also a member of Sigma Beta Delta Honor Society. Nicole says, “April 7, 2018, was the day I walked out of the CW campus asking myself, did I really just make the right decision to place myself into debt just to allow myself the opportunity to re-enter college? I was fortunate enough to have my parents pay for my associate degree, but this time it was on me. This was my choice, and my chance, to better educate myself for my future at a well-known business school. Welcome, Nicole, to the adult world. My focus and goal to succeed has served me well as I was getting excellent grades and ended my semester with a 4.0 GPA, earning a spot on the President’s List. Now, a month into my second semester I’m being inducted into the Sigma Beta Delta International Honors Society, and I am very proud of how far I’ve come. As scared as I still am about the debt I am facing after college, I know that this is going to be worth it. I am advancing myself by gaining a higher level of education and ensuring I’ll have a financially stable future. This year’s recipient is Alex Rodriguez, currently in the Accounting bachelor’s degree program. Alex is also a member of Phi Theta Kappa Honor Society. Alex says, “I believe this scholarship will help by allowing me to continue my education in pursuit of my ultimate dream to be an accountant. Throughout my life I have bore witness to what hard work looks like, and what hard work can do for you. It requires discipline and it builds character. Receiving this scholarship shows that I have displayed this quality within myself, a quality that I have attained from my mother, who struggled to ensure that she took care of my siblings and I to the best of her ability. This will show her that all the love, support, care, and discipline she gave me as a child did not go in vain. Furthering my education in accounting is my goal. My love for accounting came as a child when I watched my mother budget and balance her paychecks to make ends meet. I’m still not sure how she was able to make miracles come to our humble home in the south side of the Bronx, but she did. Interactive Digital Media and Marketing student Kahleel Neil, was selected as the winner of the Art Contest Scholarship Award. He is also a member of Phi Theta Kappa. Kahleel’s artwork was selected by the CWCF Board of Trustees to represent the 11th Annual Scholarship Fundraiser. In addition to receiving a scholarship, Kahleel’s artwork is on display in the halls of CW. Description: This work of art is a representation of the path a student, such as myself, have to travel on to achieve success. 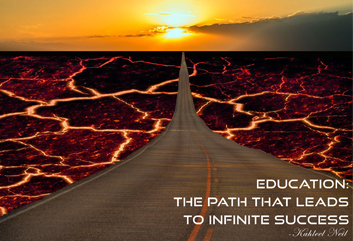 In this art, the road represents the educational journey that leads to success. The lava on the sides of the road represents the heated temptations of life that consists of the many fears and disappointments that are strong enough to hinder success. The sun light represents those who are guiding you on the road to success. This year’s recipient is Ashley Marcelino, currently in the Healthcare Services Administration bachelor’s degree program. Ashley is also a member of Sigma Beta Delta Honor Society. Ashley says, “Since I was young, I always had this made up timeline in the back of my head. As I grew older, I realized you have no control of what life throws your way and that there is no schedule that we must follow. We are all different with a variety of needs and goals. Wherever you are right now is exactly where you supposed to be. As I entered my last year in high school, my parents divorced and then it became a family of two with one income. I still had no idea what I wanted to be. Time was running out and I could only afford to earn an associate’s degree while working two jobs to pay my tuition. I thought it was a safe choice to choose Business Administration since it’s such a broad field with so many open doors. I quickly climbed the ladder and one year rapidly turned into seven years. I had gotten comfortable and deep down was unhappy in my field. I knew I needed a breakthrough and wanted to switch careers so bad but was afraid to take a leap of faith. Until one day the bank went through a merger and my whole department got diminished which left us with a three-month warning. I had a mix of emotions which left me feeling lost with professional self-identity.